Remember that great idea I had to drive home from Spain to Scotland? Those who know me at all would know the chances of that working are on the slim side of none. But at first, it really seemed possible. We said emotional goodbyes to Francisco and Emilia, our wonderful Spanish landlords. They had already had the entire summer to experience the wonder and mystery that was the Hub’s beloved Classic, a quarter century of automotive history under its hood. So of course they begged us to let them know when how if we made it home. 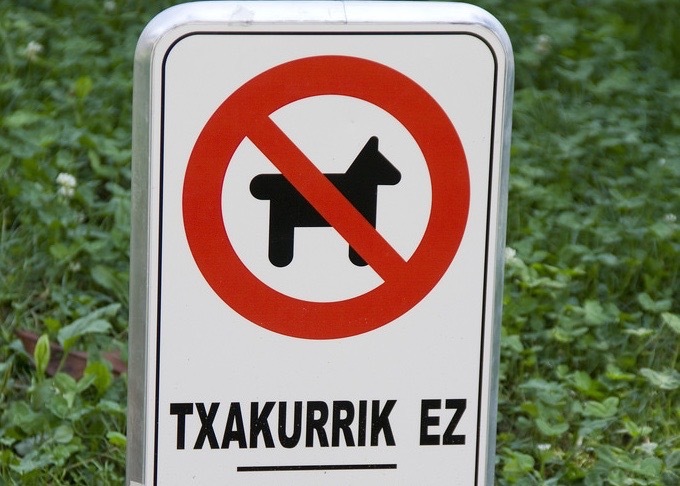 The first day’s drive took us through the stunning scenery and incomprehensible signage of Basque country (which clearly must have been written during a big sale on letters X, Z, and T because most words have a distinct shortage of vowels). 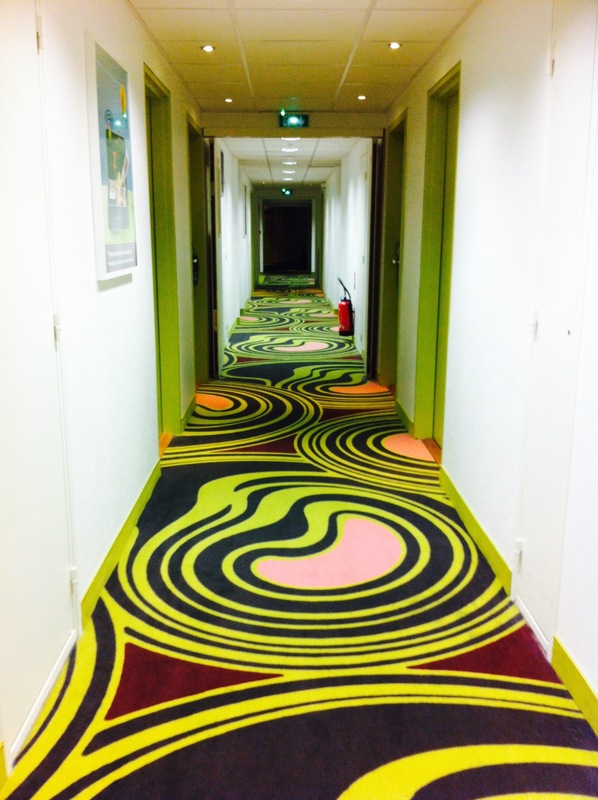 We stopped for the night in the insomnia-themed decor of the Ibis hotel in Saint-Médard-en-Jalles near Bordeaux. 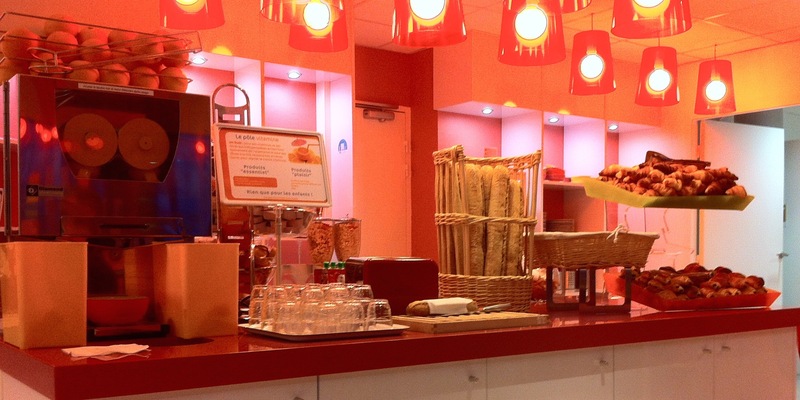 But all was forgiven when we got to the breakfast bar with its fabulous fresh-squeeze orange juicer, trays of croissants and pain au chocolat, and cappuccino. So far, so good. Giddy with success, OJ, caffeine, and chocolate, we headed north for Paris. Me: Wouldn’t it be better if we didn’t drive right up the middle of Paris? SatNav: Center of Paris it is. The Classic: Seriously? Well, check out my oil light. Hub: I think we’ll just take a little break here in Paris. Me: Crap. Well, at least I can blog this. Back on the road again, we’d gone about a kilometer. Me: [let’s pretend I said something profound that didn’t involve four-letter words. Lots of them…] But I can blog this. So we called our insurance company, which is based in the US but has an office in London, which has a subsidiary affiliate in Germany, which called a tow truck. It was a Saturday evening, blazing hot, in the middle of August. France was, of course, on vacation. But eventually, the various insurance entities (not one of which, it soon developed, spoke any French), chartered a tow truck. A few hours later, an amazingly modern truck pulled up. As veterans of The Classic’s medical needs, I’ve become something of a tow-truck connoisseur, and I can tell you that this was one Rolls Royce of tows. It had remote-controlled ramps and pulleys that soon had The Classic resting comfortably high above the street, my little dog peering pathetically down at us. 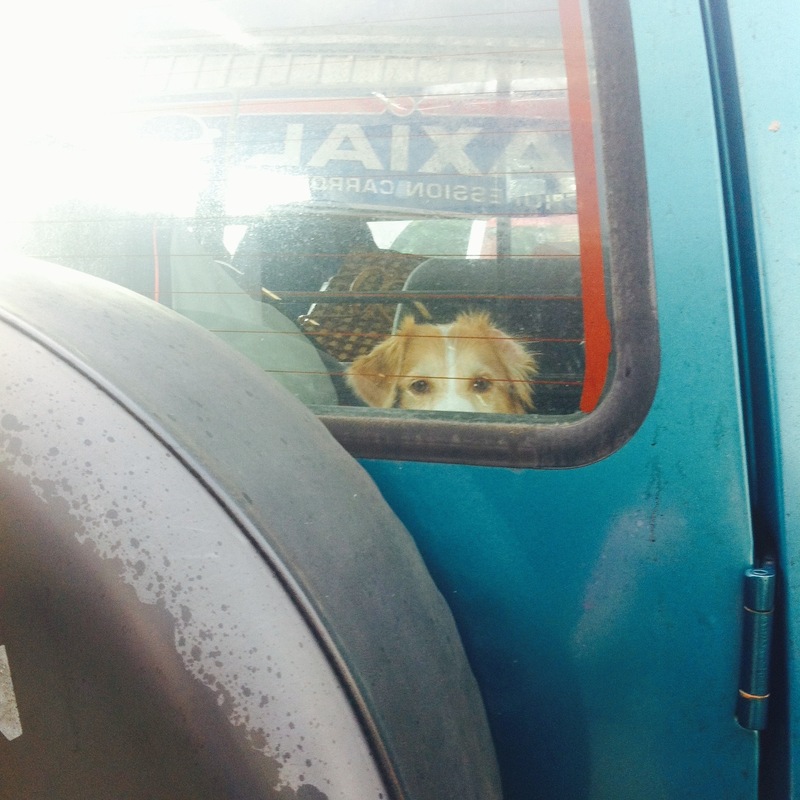 The driver was not a dog man, and refused her admittance into his cab. We soon saw why as we were invited to step into his air-conditioned luxury. The cab had two seats in the front, and in the rear were two more, with a lovely little fold-down table separating us. Hub: I’m calling the insurance company again. Me: I’m so going to blog this. So there we sat, while our insurance contact in Germany called the office in London who called the office in the US who attempted to call the towing company. The driver wasn’t too concerned. He had us, the Classic, and the dog. Me/Pollyanna: At least I can blog this. Hub/In Shock: How much is that in dollars? We were experienced, sophisticated travellers. We knew extortion when we saw it. Did we threaten to call the police, his bosses, the American Embassy? Did we use our rusty high school French (I only remember the naughtier nouns) to attempt to reason? Did we then haul out the “Credit card. Visa” and fork it over? Of course we did. Soon we arrived at a bustling garage. Despite the fact that it was late on a Saturday evening, the place was hopping. Our tow truck extortioner unloaded the Classic, pocketed the credit card slip, and was on his way to commit larceny on other stranded foreigners. The garage mechanics were very kind. They showed us to a waiting room, and went out to triage the Classic. Surprisingly soon, they were back with their professional diagnosis. I believe their technical term was “kaput.” Apparently, in the last hour, the Classic had gone from mostly dead to all dead. All that was left was for us to go through the seats and look for loose change. And unload about a metric ton of stuff we’d packed because the Classic was big enough to host its own zip code, so why not bring everything? We took the bare minimum, called a taxi, and headed for a hotel. Funeral services could wait. We were going to be in Paris for a while. So how about you? When a trip goes wrong, what do you do? 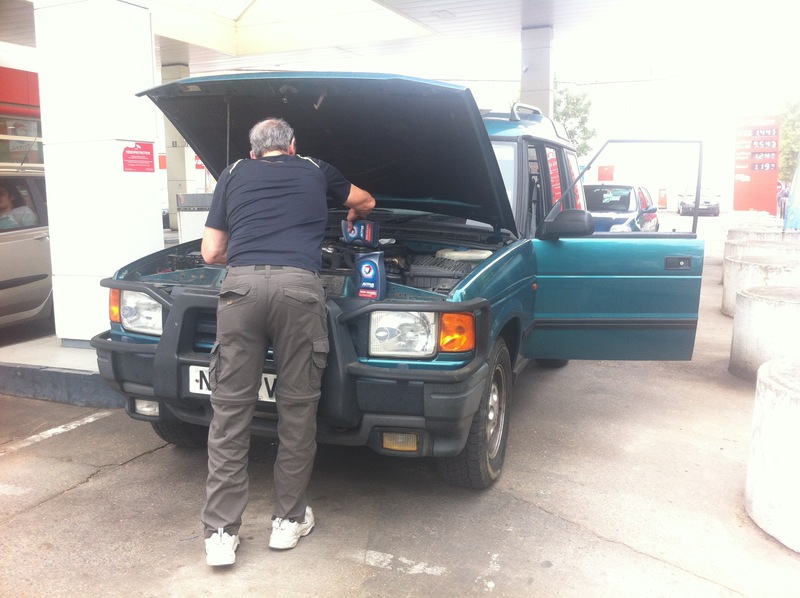 Mon Dieu… what a trip… Though there are worse places to be stranded, stranded is never good. Mind you… it is that single word from the dog I am curious about…”Again”…? Sorry! I didn’t even think about it appearing that way. But there’s no way I could do a humor post if I lost the dog. Hmmm… Maybe I should make some changes. Yeah that tow truck guy was a real dirtbag. I hope you were able to express your displeasure to someone who gave a toot and could maybe even make a difference! We’re working on that part. Meanwhile our lovely insurance company refunded the difference to us because they had called the guy in the first place. I don’t think I’ve ever had a trip go quite so wrong. There was the one and only time I tried camping with a borrowed igloo tent, which exploded when the OH was pumping it up. We had to find a B&B on Skye – and they wouldn’t let the dog in so she had to sleep in the car. I follow the WussAdvisor’s travel mantra: never stay someplace you have to put on shoes to use the loo. So my hat’s off to you for even attempting the igloo. And well done for exploding that sucker. Nicely played (except for the poor dog). But I’m guessing even the dog preferred a nice comfy car to an exploding igloo. We’ve driven through France about ten times from Calais to various points from Bordeaux down and every single time, whatever we put into the sat nav, it always insists on taking us on some complicated, nerve-wracking route through Paris. Think it’s time to go back to a proper map 🙂 Hope the rest of your trip home was more successful. We got home in the early hours of last Sunday after a thirteen hour drive – don’t think I could manage any more that that so I do admire you – and the dog! The adventures were just beginning. It was another week (and at least one more blog post) before we made it back to the Hobbit House. AS Sue pointed out, it was a week in Paris in the summer. Soft landing! You poor dear! Your poor dog! No, you don’t understand. I was ‘stuck’ in Paris. For a week. In the summer. Softest landing possible. Oh. The French can be soo clever at not understanding a word of English when it suits them. Quite useful, I would imagine. What a story – and worse places to be stranded – other than it being crashingly expensive. Shame about the car…how many miles had it done in its life? So how are you enjoying Paris? And where is the “metric ton of stuff”? I’m entertaining some unusual visuals … Can’t wait for the next instalment! I’ve come to this late so where’s the dog now – never mind the car, Barb – and another thing – if my contribution to all the hassle was ‘ I can blog about this’ – Husband here would have abandoned me with the dog. Mind you – Paris – hmm. Would I mind?!! But think about the results…”stuck” in Paris for a week in summer. Not exactly torture!